The following is a complete list of the 22 metropolitan areas in Florida, as defined by the United States Office of Management and Budget. The largest, Miami metropolitan area (Miami-Fort Lauderdale-West Palm Beach), is ranked 7th among the top metropolitan areas in the U.S. 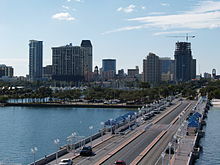 The second largest, Tampa Bay area (Tampa-St. Petersburg-Clearwater), is ranked 18th among the top metropolitan areas in the U.S. The following table lists population figures for those metropolitan areas, in rank of population. Population figures are as of the April 1, 2017 U.S. Census estimates. ^ "Annual Estimates of the Resident Population: April 1, 2010 to July 1, 2017". United States Census Bureau. Retrieved April 7, 2018. This page was last edited on 14 October 2018, at 14:17 (UTC).